Hutchinson-Gilford progeria syndrome (HGPS), also called progeria and premature aging syndrome, is an extremely rare genetic disorder that causes premature aging shortly after birth. Although patients with HGPS have normal intelligence and motor control skills, they have distinct physical features that make them appear older than they really are. This is because a random genetic mutation causes cells in their bodies to die earlier than normal. It is estimated that HGPS occurs in about one out of eight million births. However, some researchers believe the incidence might be closer to one out of four million births because many cases may be undiagnosed or misdiagnosed as other conditions, such as Werner's syndrome (a very rare, autosomal recessive disorder also characterized by premature aging). Only about 100 cases worldwide have been reported in the medical literature. Children with Progeria are born looking healthy. When they are about 10 to 24 months old, features of accelerated aging start to appear. Motor and mental development: Motor development and mental development are unaffected by HGPS and have same intellect throughout the life as any other normal human being. 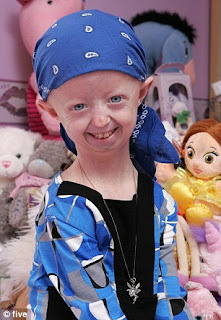 Although they may come from varying ethnic backgrounds, children with Progeria have a surprisingly similar appearance. Children who suffer from Progeria are genetically susceptible to premature ageing. 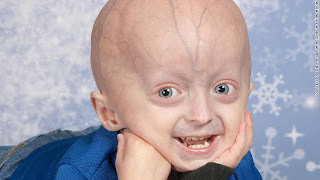 Children with Progeria commonly experience cardiovascular events, such as hypertension (high blood pressure), stroke, angina, enlarged heart and heart failure - conditions linked to aging which is the most common cause of death in such individuals. 90% of children with Progeria have a mutation on the gene that encodes Lamin A, a protein that holds the nucleus of the cell together. It is believed that the defective Lamin A protein makes the nucleus unstable. This instability seems to lead to the process of premature aging among Progeria patients. Progeria appears to occur without cause - it is not seen in siblings of affected children. In extremely rare cases more than one child in the same family may have the condition. Early diagnosis of Progeria is very important because prompt treatment and regular medical checkups shall help extend the child's lifespan. Cardiac stress testing may reveal signs of early atherosclerosis of blood vessels. Genetic testing can detect changes in the gene that causes progeria. 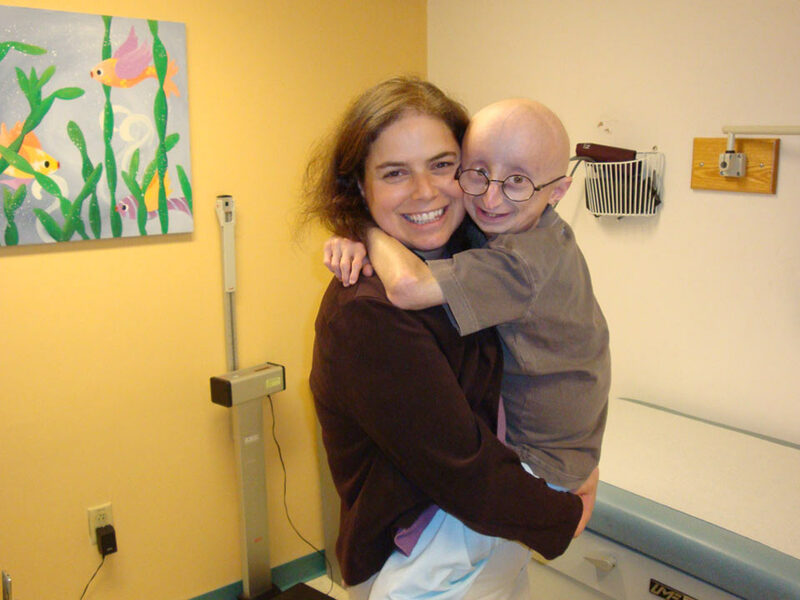 People with Hutchinson-Gilford progeria syndrome (HGPS) may live to be 7-30 years old. On average, most people die at age 13. About 90 percent of children with HGPS die from complications related to atherosclerosis. Atherosclerosis (hardening of the arteries): This leads to cardiovascular abnormalities, including congestive heart failure, heart attacks, and strokes. Malnutrition: Malnutrition is another common complication of HGPS because some infants have difficulty in feeding. Osteoporosis: In this condition, bones become weak, brittle and porous. As a result, children with Progeria may have an increased risk of experiencing bone fractures than healthy children. Hip dislocation: This is usually seen after a few years, making them unable to move. There is currently no cure for Hutchinson-Gilford Progeria Syndrome. New drugs, called farnesyltransferase inhibitors (FTIs), which were originally developed to treat cancer, may help treat HGPS in the future. Early studies have produced promising results. In laboratory and animal studies, these drugs have effectively corrected cell defects that cause HGPS. Specifically, they have been shown to improve nuclear shape by preventing the abnormal protein from reaching the scaffolding of the cell nucleus. However, additional human studies are needed to determine if FTIs are safe and effective for people with HGPS. Although there is no specific cure yet, daily care plays a vital role for their quality of life. Proper nutritional, physical, and occupational therapies, along with preventative cardiac and other care are essential. It is important that patients regularly visit their doctors, especially their cardiologists. These doctors can help patients manage serious cardiovascular complications, such as atherosclerosis. Low-dose aspirin: A daily dose of aspirin may be recommended to help prevent heart attacks and stroke. Children should only take aspirin under the strict supervision of a healthcare professional because serious side effects may occur. Physical therapy: Physical therapy may be beneficial for children with HGPS because they typically have low muscle tone and experience joint stiffness and hip problems. Feeding tube: Some infants with HGPS may have difficulty feeding due to physical abnormalities. In such cases, a feeding tube may be needed to ensure that the child receives proper nutrition. Removal of baby teeth: A child's permanent teeth might start coming in before the baby teeth have fallen out. If this happens, a dentist usually removes the baby teeth in order to prevent complications, such as overcrowding. Ayurveda treatments: Upcoming in next post- Ayurveda can help Progeria - Part 2. VishwaCARE offers Ayurvedic treatment globally for all chronic and refractory health problems. Dr.Jaina Patwa uses high quality organic herbal extracts which are easy to take, effective and completely safe for long-term use. Remedies For Angina . Take care. which is more effectively than others. We are here to assist you.